AR Composer makes it easy to view 3D assets in AR. Here is how to use the app. Make sure your device is compatible with ARCore / ARKit: the model number should appear in this list. iPhone / iPad: install the app from the App Store. Android: contact us to receive an .apk to install on your device. 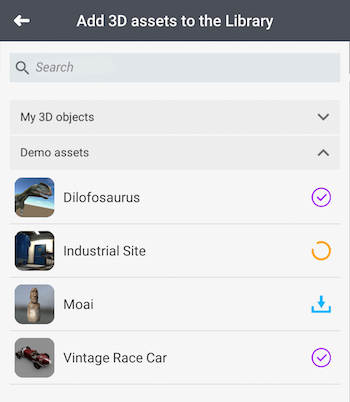 In the Library tab, tap Preview for the asset you wish to position in AR. Aim your device at the flat surface where you want to position the asset. After 1 or 2 seconds, the 3D asset will appear, semi-transparent. Big assets may not show the very first time you launch them - especially if you loaded several ones at the same time at the previous step. In case the loader spins on your screen beyond 1 minute, tap Exit, wait 3 minutes then tap Preview again. Tap the Check button at the top right corner to save the position. You can now walk freely around the 3D asset, observing it from every angle. Just avoid moving too far away from it. If the 3D asset disappears from the screen, aim at the place where you have positioned it to get it back; you may also need to take a few steps back. To allow other users to see the 3D asset where you have positioned it, you need to create a persistent AR Scene - which requires an iOS device. To learn more, consult this article.